It’s empty now but a lot of stories and memories are shared in this room. The dining room is our favorite room in our home. When the kids were younger, we were in this room every single night. Now with everyone’s busy schedule, Monday is the only weekday (for now) that everyone gets to be together. No TaeKwon-do, no choir practice, no gymnastics, no band practice, no music lessons, no track and field, no other activity than be home with the family! That’s why I treasure my Mondays – or any days when every one of my crumbcatchers’ are home for dinner! Depending on everyone's moods, conversations are usually related to current news - school, friends, families, news media, and movies. When I was a "younger" mom, I must have been post-partum or stressed-out that I used to use this time to vent and give the kids’ their to-do-list or progress report. That is NOT an ideal scenario and I’m warning new mothers (especially the tired and over-worked moms) – don’t say things that will ruin everyone’s appetite. Keep the conversations light, funny and uplifting. Dinner time, I’m usually providing some laughs since I come up with words that I have no clue what they mean – words I hear on the news and not realizing that they mean “not-good”. How would I know what “tea-bagging” means? Only my 8yo and I are confused why everyone laughed when I asked what that word meant. As we savor left-over chicken, pasta and spinach, thunder and lightning provided added “power” to our “power-down” kick-off day. As usual, I'm happy to provide some entertainment to my children with my ewok moments. Love your blog, Jenjen. (I have a boy named Josh, too!). Our family room is completely open to the kitchen and dining area. I love this! MY FAVORITE ROOM HAS ALWAYS BEEN THE KITCHEN! THE KITCHEN IS THE HEART OF THE HOME. FOOD BEING PREPARED AND COOKED WHILE WE CHATTER AWAY - I LOVE THE HOLIDAYS WHEN WE SPEND ENDLESS HOURS IN YOUR KITCHEN COOKING SIDE-BY-SIDE. WE ARE AN AMAZING TEAM - WE CUT AND CHOP AND STIR AND TALK AND LAUGH AND NEVER GET IN EACH OTHERS WAY. AND WE TURN OUT SOME REALLY GREAT MEALS. I FIND COOKING AND BAKING MY BEST THERAPY. 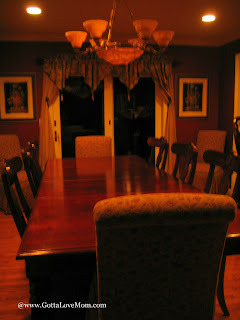 MY OTHER FAVORITE ROOM IS YOUR DINING ROOM WHEN WE ARE ALL TOGETHER! HOPEFULLY, WE WILL ALL BE TOGETHER FRIDAY EVENING. I HOPE THE KIDS WILL BE HOME.